Two different shrubs. 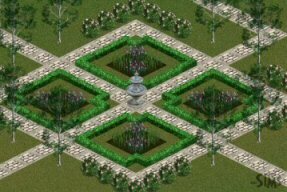 Combine both and draw a beautiful garden. The Dome is based on a rug so you need to make the first floor to put it on. For a better look I use the transparent floor from Caro’s Sim Kagen on the second floor. Both dome and colum are dropable when walls are down. 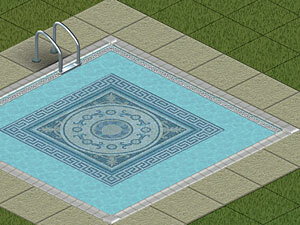 A new adition to the pool set is now avaliable for download. 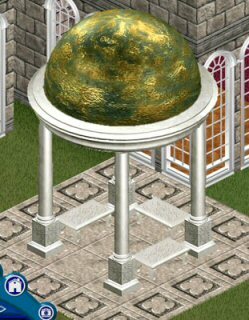 This time I’ve made some walls around the pools, and added some fountains into the pools too, a cream white new column (dropable) adds a more sophisticated look to all the set. 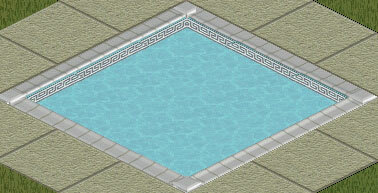 The wall fountains are animated and can be placed anywhere but they are intended to be at pools sides. 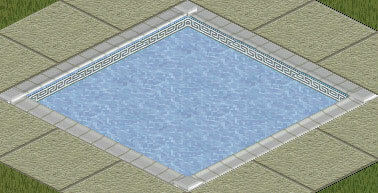 The small fountain comes in 2 water textures and can be placed on terrain or on pool. 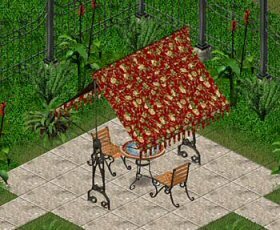 The walls and corners are Living Large objects, cloned from an original Maxis rug that I hacked. 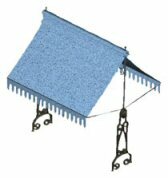 The blue set comes with a matching pool diving board. I want to do a small recognition to Bunny Wuffles from Architectural Supplies for Sims for her generousity and talent creating all her wonderful objects. 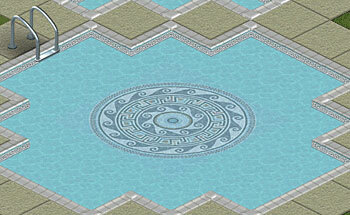 As I’m in love with her Turkish Bath Set I wanted to add some pool tiles wich can be shown and downloaded below. 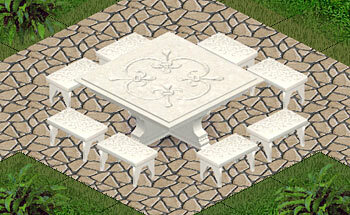 Thanks to Bunny Wuffles for allowing me to use her walls and floors as a base for the tiles. Please, do a visit to her site if you want to learn something about the turkish baths and of course download a lot of wonderful objects of her Set. 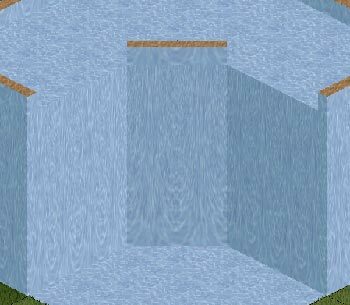 I’ve made some walls and floors to match the water textures of the pool set, they can be used for example for a simulated 2nd floor pool and a cascade wall. In case you haven’t tried it, the objects of the pool set don’t need a pool being build to be used and you can use them at the second floor to simulate a fake pool. 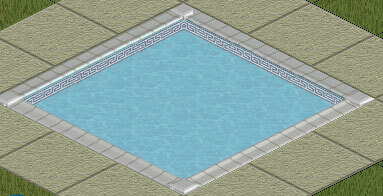 Bored with the same blue color of your pools? I’m too and I decided to add some more live to mine. Today I bring you part 1 of my new pool set. 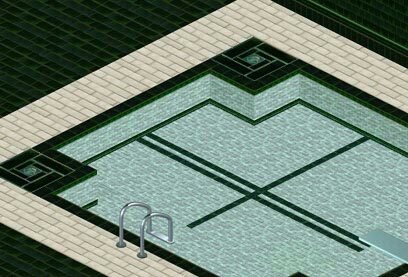 The base objects are Maxis ones but I made some small hacking and they can be placed on pools, and of course your sims can swim without problems. 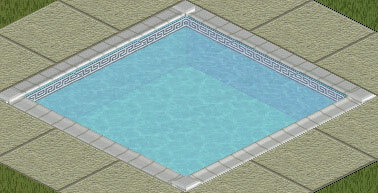 There are also 2 different water mosaic wich you can add to your pools to make them more attractive. 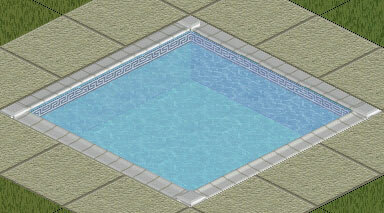 Perhaps some of you would like to add your own textures or pictures to the pool tiles. Well, you can use my bases if you like without asking me for permission to use them, only a link to my site would be grateful, but as always not mandatory. 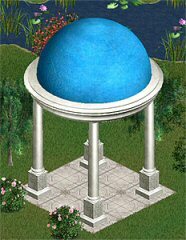 Just a decoration for your pools.